who put darkness for light, and light for darkness;"
As I survey the wreckage of the Obama landscape, I fear that my predictions before the election may sadly come true. Although some dismissed me (even people I thought would give me a fair hearing), I predicted that, if elected, Obama would lose the wars in both Afghanistan and Iraq, and that the US would be hit hard by more terrorist attacks. It is obvious that Obama does not stand against evil internationally. He failed to denounce the rigged elections in Iran; he chums around with Hugh Chavez, a Marxist dictator; he does not even mention international terrorism when he "speaks to the Muslim world" in Egypt (although he does speak of the Koran as being "revealed.") Our General on the ground in Afghanistan tells him that only a troop surge will prevail against "mission failure" there, yet he refuses to immediately act and considers troop withdrawls. I doubt he has the nerve to make the victory stick in Iraq, especially given his gutless approach to Iran, which has sponsored terrorists in Iraq. An unprecedented four major terrorist plots have been thwarted in recent days. (The Denver conspirator was arrested, but it is not known how much damage he may have done already by making bombs). Yet the Patriot Act is coming up for renewal. It is unlikely that the Obama-esque Democrats will vote to renew it. If so, more terrorist conspiracies will continue fail to be broken up. The results would be catastrophically deadly. As I said, months ago before the election, contemporary Democrats do not understand the forces of evil in the world or how to confront them. They are Utopians, thinking that kind talk and kid gloves will dissolve ill feelings, especially when accompanied by much apologizing for (supposed) American evils worldwide. It is likely that we will soon discover the results of such foolishness and reckless irresponsibility. RealApologetics did a short informal interview with me that is now posted. It is about 25 minutes long. Glen Beck's new book strikes me as pathetic and silly. The cover is infantile, as is the title. The text (what there is of it) is littered with silly graphics and call-outs everywhere. It is more of a picture book than a piece of prose. To oppose the dangerous Obama statist/internationalist/defeatist agenda we need something much more serious than this. In the Nota Bene section of the December 12 issue ("Science and Spirituality," The Chronicle Review), Evan R. Goldstein refers to intelligent design as "anti-rational and anti-intellectual" and lumps it in with New Age philosophy. (He is agreeing with the claims made in The Constant Fire: Beyond the Science vs. Religion Debate, by Adam Frank.) This commits the fallacies of ad hominem fallacy and guilt by association. On ad hominem: The leading thinkers of the intelligent-design movement have doctorates in science and/or philosophy and appeal to empirical evidence and proved means of design detection. This is hardly anti-intellectual (although their conclusions cut against the grain of much of the intelligentsia). On guilt by association: I have written several books critical of New Age philosophy. Its approach to reality (magical thinking) and its conclusions (pantheism) are a million miles from those of intelligent-design scholars. This underscores how important it is to present a scientifically credible Christian worldview. Of course the universe was not created in seven days, but six. The seventh day was the Sabbath. And, of course, the Big Bang supports creation ex nihilo. And we need not insists that each "day" was 24 hours. One could go on--and I do in my next week--sure to be a blockbuster best-seller. It is called The Apologetics Code. Read Charles Colson on The Signature in the Cell. In the short video promotion of his new book, The Greatest Show on Earth: The Evidence for Evolution, Dawkins rather remarkably admits that while all his previous books have been about evolution, none of them gave evidence for it. The previous books assumed it. Well, well, then all that railing against opponents of Darwinism as insane, ignorant, or evil was made without giving any arguments for evolution. This is false. His books have tried to refuted design explanations and have advocated Darwinism. Yes, Dawkins assumes naturalism, so Darwinism must follow. He also tells many "just so" stories which pose as explanations. But has attempted to defend Darwinism in these books. But given the sustained critique of Darwinism by ID, Dawkins and others, such as Coyne, believe they need to give the definitive refutation (yet again). While I have not yet read the book, I predict that when Dawkins engages serious critics of Darwinism (if he does at all), he will misrepresent them them and fail to take their arguments seriously--just as he did in The God Delusion. The federal government has now told all companies that provide Medicare Advantage to seniors to stop communicating with their clients about the effects of that legislation — even telling them what they can and cannot post on their websites. This gag order, enforced through an agency of the federal government at the request of a Senator, is wrong. See my reply to this silly post on faith and science. Scroll down to comment #62. Here is Jane Norton's speech given last week when she announced that she was running for US Senate in Colorado. Her husband told me that she wrote it! She told me she decided to run because of Obama's ill effects on the country. Here are the standards I give my students for their papers for me. Perhaps some of the advise may be of help to your writing. Of course, each professor has his or her own particularities regarding stylistic matters. I have long held that any philosopher who takes the trouble to master the art of writing clearly and is at pains to exercise it, can explain most of the things that matter in philosophy to any reader of intelligence and goodwill, provided that the philosopher understands what he is writing about—C.E.M. Joad, The Recovery of Belief (1952). 1. Use a title page that includes your name, your campus box, the class, the assignment, the date due, and the date turned in. Do not use any computer-generated graphics, weird text fonts, or other distracting images or special effects, please. 2. Double-space all papers. Use normal margins (approximately 1.25 inches on each side), leaving me room for me to make written comments. Use 12-pitch setting on your printers. Stay within the assigned number of pages for the papers unless you receive permission otherwise. 3. You must use page numbers! It is time-consuming for me to have to number the pages for you in order to find out if you have written the assigned amount. The title page is not page 1. Your first page of writing is page one. Papers without page numbers will be downgraded one half grade. 4. Use subtitles where appropriate. They give order and structure to your paper. 5. If you use a Scripture verse, put the reference in parenthesis within the text along with the translation: (John 3:16, TNIV). If you quote or otherwise refer to a biblical text, give the reference. 6. Carefully check spelling, punctuation, grammar, capitalization, paragraphing, and documentation. Underline or italicize book titles, magazine, and journal titles. Beware of incomplete sentences. Like this. Root them out with relentless and religious determination. Use the Turabian or APA standards for documentation. If you don’t know what this means, please find out. 7. Beware of redundancy, vagueness, convolution, and incoherence in sentences. 8. If English is not your primary language, and you have difficulty writing in English, please have someone proofread your papers before handing them in. 9. Do not plagiarize! Plagiarism is intellectual theft and is a sin. Any idea that you owe to someone else (that is not general knowledge) must be documented. Any direct quote must be put into quotation marks and cited. Any paper showing signs of plagiarism will receive an “F” grade. 11. Do not be overly autobiographical. Do not write, “I think that X is true because of Y.” Simply write “X is true because of Y.” Any personal references must directly relate to the substance of your paper. 12. Periods, commas, etc., go inside quotation marks—“Like this.”—not outside of them—“Like “this”. Semicolons do not go inside quotation marks. Please figure out the difference between a colon and a semicolon. They are not identical or exchangeable in sentences. 13. Be careful to identify pronouns such as “this.” Often the reader does not know what “this” stands for. It can give graders a headache—and students lower grades. 14. The upshot is this: sloppy papers will not get good grades. 1. Be very sure to answer the question you have been asked to answer and not something of your own invention (however brilliant that may be). If there is a choice of questions to answer, stipulate which question you are answering in the body of your paper. I don’t want to have to guess what question you are addressing. For the short papers, use materials from class primarily, not outside sources. Do not cite my lecture notes when they are addressing points in your required reading. That shows that you probably haven’t done the reading! 2. Good papers begin with an engaging, clear, and pertinent introduction, which draws the reader into the paper, outlines what the paper will do, and points to the first topic to be discussed. 3. Be sure to end the paper with a conclusion, which summarizes the main points of your paper. Some papers end very abruptly. This is bad. 4. Paragraphs should contain only one main idea. They should not go on for several pages, nor should they be only one sentence. 5. Do not overuse direct quotations from sources. Stay away from long citations. I want to know how you summarize and interpret the material. The paper is your work, not a compendium of other sources. 6. Never apologize about the quality of your work in a paper or on a note attached to the paper. Let me decide. That’s what professors are for (among other things). 7. For general help in grammar, syntax, punctuation, and good taste, see William Strunk and E.B. White, Elements of Style, 4th ed. (Boston, MA: Allyn and Bacon, 2000). It is still a classic. "Writing a book is an adventure; to begin with it is a toy, then an amusement, then it becomes a mistress, and then it becomes a master, and then it becomes a tyrant, and the last phase is that just as you are about to be reconciled to your servitude you kill the monster and strew him about to the public." -Sir Winston Churchill. Indeed. I have been working on a books since 2003. Comments by Kevin Winters and John Stockwell will be neither read nor posted. Please give up and move on. The injustices and inequities of nationalized health care are explained by Charles Colson. This is reform we do not need in the United States. There are far better ways. I will be speaking at the Denver Seminary chapel on October 5 and 6 , at 11:00 AM, on spiritual warfare, addressing material in Acts 13:1-12 and Acts 19:1-20. I will also be preaching on the armor of God (Ephesians 6:10-18) at Wellspring Anglican Church on October 11. Services begin at 9:00 and 10:35. A short video on the Intelligent Design conference in Castlerock, CO. Please join us for the next meeting of the Denver Chapter of Christians for Biblical Equality. We will meet Monday, September 28, 11:30-1pm in the Executive Board Room at Denver Seminary. A complimentary light lunch will be served at 11:30am. The program will take place from 12:00 to 1:00pm. You will find a very unfair view of Francis Schaeffer written in The Christian Standard. If you click "Letters to the Editor," you will find my response. I am quoted in this article, "The Art of Cyberchurch," from Christianity Today. 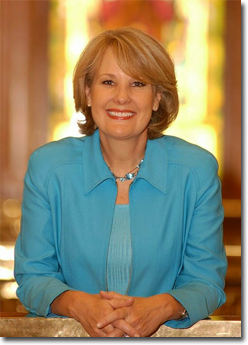 Jane Norton, formerly Lieutenant Governor of Colorado, announced that she is running for the United States Senate in Colorado. I attended her event this morning and was very impressed with her speech and her demeanor. I was already appreciative of her political philosophy. Please visit her web page and consider supporting her. I am quoted in "The Art of Cyber Church" by Sarah Pulliam in the September, 2009 issue of Christianity Today. It does not appear to be on line as yet. Well over a million attended a rally in Washington, DC on Saturday, although The New York Times said it was only "tens of thousands." For the Times, the numbers shrink when the crowds are opposing Obama's plan to take over health care, European style. Dr. Jerry Bergman, a long-time critic of Darwinism and prolific author, has written an important book called, Slaughter of the Dissidents, which reports on and documents the unfair persecution experienced by academics that dare to doubt Darwin. For those who think the stories related in the film "Expelled" were untrue or overstated, this book will demonstrate that the stories of the film only scrape the ideological surface. The Lost Symbol will be released Tuesday. It has already been reviewed by The NY times. It is one of the "icky poo" books I must read given my line of work and calling, just as I read The Da Vinci Code. I encourage Christian thinkers and writers to take this book seriously and present a logical and Christian response to it wherever you can. Brown will present a pop-occult worldview that will further deceive and confuse people who do not know how to address it (which includes most American Christians, sadly). I hope to write a review of it when I can (sooner rather than later, given the lightning-fast nature of culture these days). Brigette Gabriel was bought up in Lebanon when it was peaceful and democratic. Her life was shattered with Muslims bombed her Christian city. She was severely injured and lived for several years in a bomb shelter. She eventually left her beloved country when Muslims took over and made life for Christians impossible. She spent several years in Israel as a television news anchor (she is stunningly attractive as well as articulate) before making America her adopted country. On Friday, September 11, Colorado Christian University brought Ms. Gabriel to their campus to speak on Islamic terrorism. As a Fellow of the Centennial Institute, I was invited to a reception in which she passionately spoke of her commitment to expose the goals that Islam has on America through her organization, ACT for America. She later addressed several hundred people, telling her story, the history of Islam (a masterful summary in about five minutes), and explained the Islamic strategy to impose sharia (Islamic) law worldwide and, yes, in America. She claimed that many mosques has terrorist ties and that they were actively advocating the gradual imposition of sharia law. This is well advanced in Europe and in some parts of the US, such as Dearborne, Michigan, where the Muslim call to prayer is blasted over loudspeakers in public streets. Muslims have developed state school curriculum to proselytize for Islam. I could go on, but suffice to say that Ms. Gabriel is a compelling and courageous figure. She sports a remarkable personal story, speaks nearly flawless English with a distinguishing Lebanese accent, is gifted with boundless energy, and is a true patriot for her adopted country. I hope you will visit her web page, join her organization (which lobbies for national security with respect to the Islam threat from within and without), and read her two books: Because they Hate and They Must be Stopped, both New York Times bestsellers. I plan on using one of these when I teach Christian Ethics next term at Denver Seminary. Police protection was provided for her talk at Colorado Christian University. You can imagine why. She needs your prayers as well. I provided the concluding prayer the night that she spoke and prayed Psalm 91:1-2 on her behalf, among other things. Obama lied again tonight about public funding of abortion under this health plan. Get the facts here. Please read Jeremy Green on the dangers of Obama's heath care plan. Do your best to come to me quickly, for Demas, because he loved this world, has deserted me and has gone to Thessalonica.--2 Timothy 4:9-10; emphasis added. Some are only visiting the spectre world of sin's allures; they will be chastened by God and return to Christ. Others have given themselves over to this present world, having never truly left it to follow the lamb of God in time and eternity. The Bible warned us of this in advance, but seeing it played out through real people still breaks one's heart. With Dan Brown's new book, The Lost Symbol, due out September 15, everyone should be up to speed on his basic worldview and MO. This New York Times editorial is helpful to explain his message and popularity. I will be speaking on a biblical and scientific view of the origin of life at Grace Chapel on September 13, 2009. Their service times are 9:00, 10:45 and 6:00. Hope to see you there. As many of you know, I do not watch television. But occasionally, I watch a segment on YouTube. I just did and it appalled me deeply. This is a four-minute "story" on the teaching of science in Texas. I favor "teaching the controversy" over Darwinism. Darwinists typically do not. However, you will not learn anything of substance from this special-effects laden, image-mongering, sound-bit crazed, and factoid-frenzied hyperactive hodgepodge. Since I do not watch TV, when I see something like this it is jarring, startling, and intellectually offensive. It frightens me to think that people live in this world--on an average of four hours a day, according to the new Nielsen ratings. There is simply no way to gain any meaningful knowledge about this issue from this format. They took hours of interviews and used no more than 10 second sound bites. They tried to distill (and dramatize) important scientific, pedagogical, and legal issues into four minutes of rapid-fire image explosions (with musical background where needed, of course). Friends, stop watching TV for just ten days. Then go back and watch. You will be stunned. You will be better for it. Leave the cave and ascend to reality. If you didn't know, I am experimenting with Twitter. My name on it is DougGroothuis. I use proper grammar, no abbreviations, and avoid trivia. So, what am I doing there? Subverting it. You have heard of "air guitar" or "air drums." One imitates playing a musical instrument, usually with histrionic excess (rock style). But, of course, one cannot play these instruments (typically). One merely pretends, usually with narcissistic abandon. Sadly, many Christians play "air apologetics"--they pretend to defend Christianity in the face of unbelief, but really only pretend to do it by relying on cliches or talking superficially only among themselves. What can be done? Repent and strengthen the things that remain, for the Kingdom is at hand and were are audited by Eternity. The doctrine of objective value [is] the belief that certain attitudes are really true, and others really false, to the kind of thing the universe is and the kind of things we are. . . . Because our approvals and disapprovals are thus recognitions of objective vale or responses to an objective order, therefore emotional states can be in harmony with reason (when we feel liking for what ought to be approved) or out of harmony with reason (when we perceive that liking is due but cannot feel it). No emotion is, in itself, a judgement: in that sense all emotions and sentiments are alogical. But they can be reasonable or unreasonable as they conform to Reason or fail to conform.--The Abolition of Man (New York: Simon and Schuster, 1975), 31-32. Centennial Institute is honored to host Brigitte Gabriel, the brilliant author and organizer courageously working to waken America to the threat of radical Islam, for a free public lecture in the Colorado Christian University Event Center on Friday, September 11 at 7:30 p.m.
We invite you attend, bring friends, and forward this e-mail widely. Ms. Gabriel’s remarkable story, from her Christian girlhood in Lebanon through her public leadership today as an American by choice, is spelled out in two best-selling books, Because They Hate (2006) and They Must Be Stopped (2008). Membership is booming in her citizens movement, ACT for America.Brigitte Gabriel's topic on 9/11 will be "America Confronts Radical Islam." The issue is of unsurpassed importance. The date, a somber anniversary in world history, speaks for itself. All are welcome, but space is limited. Please make your reservations today.Please RSVP to Centennial@ccu.edu or call 303-963-3424. Provide your name and the number in your party. This award will be given at graduation to an outstanding philosophy of religion student. Colle encourages all students and alumni impacted by these two professors to make additional gifts to support this award fund. To make a gift, please contact Brian Fort at 303.762.6924 or brian.fort@denverseminary.edu, or send a gift directly to the Office of Advancement, noting that your gift is for the Lewis/Groothuis graduation award fund. Ian Colle (M.A., Philosophy of Religion, 2009, Denver Seminary) has endowed an award in the philosophy of religion in honor of Dr. Gordon Lewis and myself. I am deeply honored by this. Go to page 17 of the on line Denver Seminary Magazine.